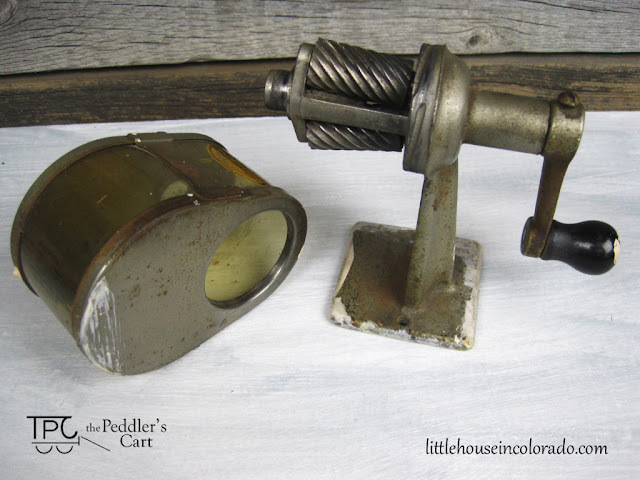 A hand crank controls two revolving cylindrical steel milling cutters that sharpen the pencils. The crank turns smoothly and the device still works well. My children, 11 and 14 years old, pounced on the opportunity to sharpen their pencils with this antique. There is a transparent, removable collection receptacle so you can easily see the level of pencil shavings and quickly discard them when necessary. Obviously, there was no mystery about this being a pencil sharpener. I used old Boston models in school for years and always loved them. 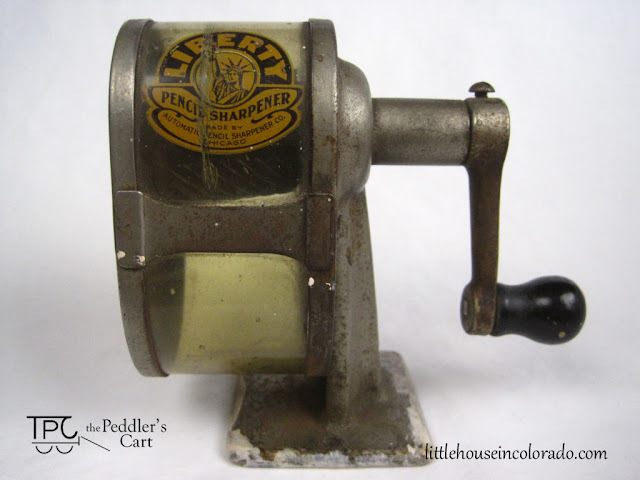 This is a Liberty Pencil Sharpener made by Automatic Pencil Sharpener Company (APSCO) in Chicago, Illinois. Finding out that part was easy. It says all of that on the front of the pencil sharpener. But finding out more information was difficult. Its' history was the mystery. Searching the vast internet, I uncovered no pictures, no articles, no nothing. I found plenty of information about the Chicago Pencil Sharpener. My Liberty model appeared to be very similar to the Chicago Pencil Sharpener (which was advertised between 1915 and 1936), but I could find absolutely no information about it anywhere. 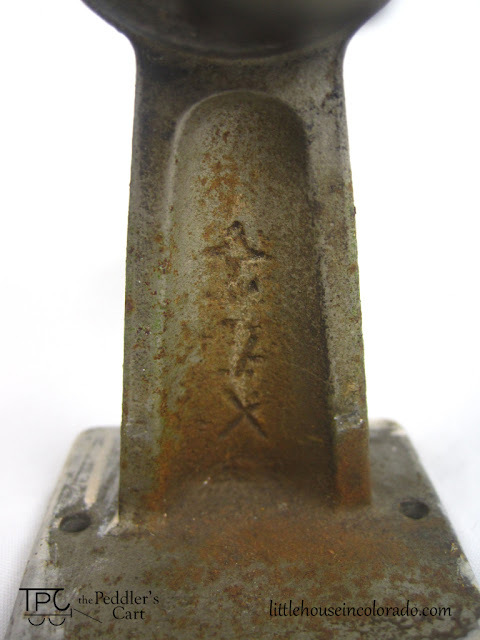 There are three patent dates on it bottom of the receptacle: Jan 9th 1900, May 1<sup>st</sup> 1906 and Jan 1<sup>st</sup> 1907 along with "OTHER U.S. AND FOREIGN PATS PENDING". 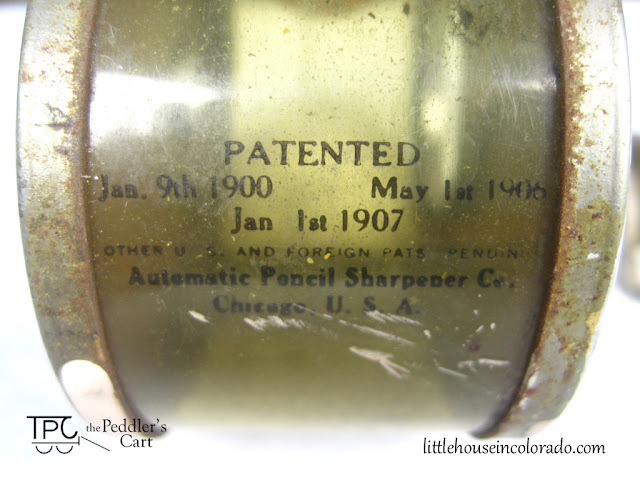 I am estimating this pencil sharpener to be from about 1914 to 1916 because later patents (those listed on later models of the Chicago model) are not listed on this Liberty model. I couldn't even begin to explain what these marks were. During my search for information, I came across a listing at Early Office Museum of Mechanical Pencil Sharpeners from 1910 - 1919. 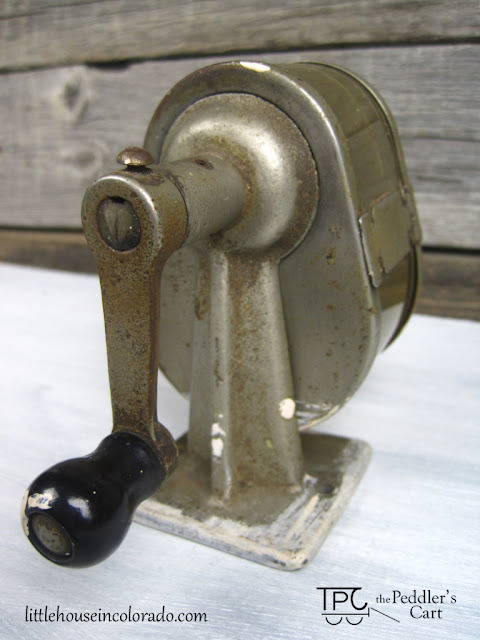 On that list was the Chicago and Chicago Giant Pencil Sharpeners but no other models by the Automatic Pencil Sharpener Company. I was beginning to wonder if my Liberty sharpener was a prototype, a rare model, or a fake. Hello,Thank you for calling this sharpener to my attention. This appears to be identical to the Chicago or the Chicago Giant model; these two differ in the width of the shavings container, and I would need a head-on photo to determine which yours is. I have never seen this with the Liberty name. And like you, I can find no reference to it. The Chicago and Chicago Giant were first marketed in 1915. Beginning in 1919 or 1920, they also showed a 1919 patent date. As a result, your Liberty was probably produced during 1915-1920. Perhaps yours was produced in connection with WWI -- either US entry into the war to secure liberty in 1917 or the Allied victory that secured liberty in 1918. With that response, it felt nice to have at least a possible history uncovered. The dimensions of the shavings receptacle are: 1 ¾” W x 2 ½” D x 3 ½”H. I'm fairly certain this makes this model more like the Chicago model rather than the Chicago Giant model. 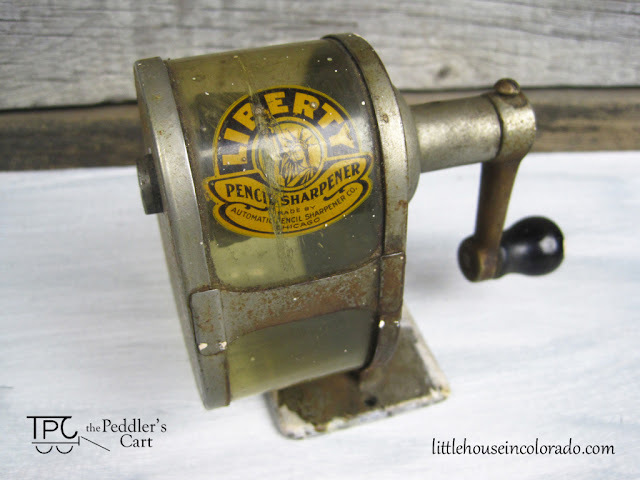 This Liberty Pencil Sharpener is now available for purchase in our Etsy shop. UPDATE: This pencil sharpener has been sold.